...... Text can be automatically aligned and indented, relative to the previous line, to aid block indentation. Print previewing, and printing with customizable headers/footers. GridinSoft Notepad has a built-in calculator that can evaluate math expressions. 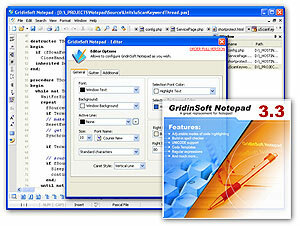 For purposes such as software development, GridinSoft Notepad has a code templates and search commands. Sets of files in a directory tree can be searched, and text can be replaced in all open documents at once. GridinSoft Notepad has a many other nice features for beginners and professional programmers! GridinSoft Notepad operates under Windows 95/98/Me or Windows NT 4.0/2000/XP/2003, and requires approximately 2MB of free disk space. No required any additional runtime libraries. Web Notepad is a web editor for real HTML coders. Powerful comfortable text editor, Notepad replacement. Notepad program that edits directly on your web server! Display Text on Your Desktop Wallpaper! Qweas is providing links to GridinSoft Notepad Lite 3.3.2.9 as a courtesy, and makes no representations regarding GridinSoft Notepad Lite or any other applications or any information related thereto. Any questions, complaints or claims regarding this application GridinSoft Notepad Lite 3.3.2.9 must be directed to the appropriate software vendor. You may click the publisher link of GridinSoft Notepad Lite on the top of this page to get more details about the vendor.